I didn't want to admit it in my previous goat post, but Artemesia is starting to trend worse again rather than better. 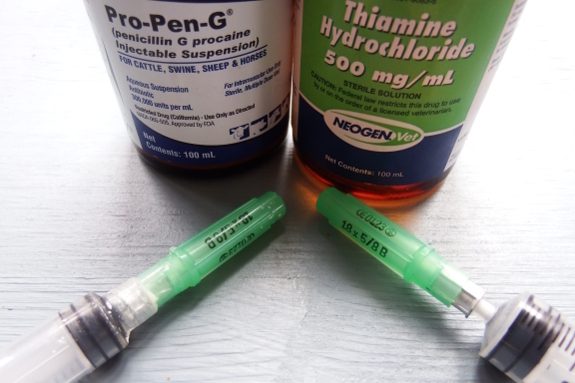 The downturn began a few days after we cut out the penicillin...which leads to the unpleasant conclusion that she may be suffering from the more serious listeriosis (a bacterial infection) rather than goat polio (a thiamine deficiency). Luckily, the vet is back in town and he was willing to talk to me on the phone rather than making us put our poor goat in the car and drive to his office. He suggested switching her over to a different antibiotic --- tetracycline --- and adding in an anti-inflammatory (banamine). Meanwhile, he told me that it probably didn't hurt her, but the dosages I'd drawn off the internet (7.3 mL of penicillin (300,000 units per mL) and 2 mL of thiamine (500 mg/mL) three times a day) were too high for a 73 pound goat. Instead, he says all she needs is 3 mL of antibiotic and 1 mL of thiamine once a day. As the family's newly skilled needle jabber, Mark will be glad to learn we're down to two shots per day. I hope that Artemesia is similarly relieved by the change in drugs and starts back onto the path to recovery. Does this mean you will have to pasteurize her milk before using it?